This show-stopping cake is easy to prepare and makes a spectacular centrepiece. Slice into the cake to reveal the beautiful coloured layers. Is it spring yet? I think so! After seemingly endless months of cold weather and gloomy skies, I am finally spotting glimpses of spring everywhere. There’s daffodils springing up in the park in great waves, the trees are covered with buds or even the prettiest of flowers and the birds in my little garden have been a lot chirpier of late. And it is Easter soon – officially the time for regeneration and rebirth. I can feel a sharp uplift in my overall mood whenever the sky is blue and an injection of creative energy that has me scribbling recipe ideas late into the night. I also feel the need to bake – cakes and macarons, cupcakes and cookies… everything that is sweet and pretty. I blame spring! Since I was in the mood and it felt like ages since I baked a proper layer cake, I asked my kids what they would like. The answers were chocolate (Anya) and vanilla rainbow (Sam). I didn’t have all the colours for a rainbow cake but since my son was being very persuasive – easy when you are five and button-cute – I agreed to have pastel layers. I was hoping they would be pastel that is, but they turned out a bit more vibrant than originally intended… If you are using food colouring build up the colour gradually as some gel colours can be very strong. You might want to mix a small quantity on a plate with a spoonful of the batter and then mix that in. 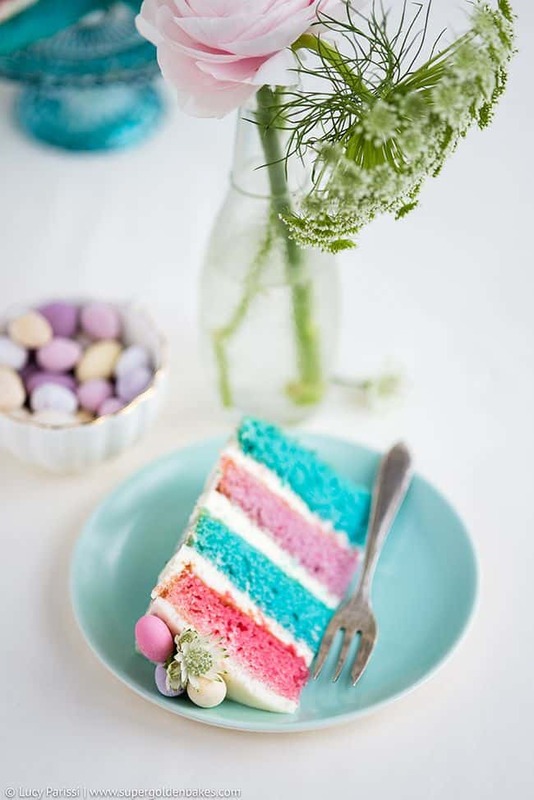 Since the sponge layers only contain egg whites they take the colour very well so you could make a rainbow or ombre cake to suit the occasion. I used mini eggs, sugared almonds, flowers and homemade macarons as decoration. I think this is definitely one of the prettiest cakes I have made. It would be perfect for Easter but also for birthday parties, wedding / baby showers or any celebration. HAVE YOU MADE MY COCONUT & VANILLA NAKED CAKE? This show-stopping cake is easy to prepare and makes a spectacular centrepiece. The recipe contains only egg whites which results in a mostly white sponge which can be coloured with gel or paste food colouring to create a beautiful surprise when you slice into the cake. Put the (empty) bowl of your stand mixer on the scales and make a note of the weight. Preheat the oven to 180C. Grease 4 x15cm/6in cake tins (or 3x20cm/8in tins) and line with greased baking parchment. Dust with flour, shaking out any excess. Put the flour, cornflour, sugar, desiccated coconut, baking powder and salt in the bowl of your stand mixer and briefly whisk together on low speed to combine. Add the cubed butter and mix on low speed until the mixture resembles coarse sand. In a measuring jug, mix together the milk, egg whites, coconut and vanilla extracts. Add the egg white mixture into the batter, in three stages, mixing well on low speed after each addition. Increase the speed and mix for a couple of minutes until batter is smooth. Weigh your (full) mixing bowl again and subtract the weight of the empty bowl. Divide the weight of the batter into 3 or 4 depending on how many cake tins you are using. Pour equal amounts of batter into 3 (or 4) separate bowls and add food colouring. It is best to start with a very small amount of food colouring on the tip of a skewer, mix well, and then increase the quantity of food colouring gradually to intensify the colour. Pour the batter into the prepared tins and bake for 20-25 minutes or until the cakes are well risen, firm on top and coming away from the sides of the tin. A skewer inserted in the centre should come out clean. Cool in the tins for 10 minutes and then carefully turn out on a wire rack lined with baking paper (the cake layers are quite sticky). Cool completely before frosting and level if necessary. To make the frosting, put the mascarpone, icing sugar, double cream and vanilla extract in the bowl of your stand mixer. Start mixing on low speed to combine, then increase the speed to highest setting until you have firm peaks. Do not over-mix. Transfer the frosting into a large piping bag fitted with a plain round tip and pipe the frosting on your bottom cake layer. Outline the edge of the sponge first and then continue filling the interior in an even layer. Repeat with the remaining layers. Smooth some frosting over the entire cake with a palette knife or pastry scraper and chill for 20 minutes. Add a final layer of frosting over the cake, smoothing so that the layers are still visible for a ‘naked cake’ effect. Alternatively you can cover the cake completely and pipe any excess frosting on top. Cake is pretty good but a little too.sweet for me. but texture is.very messy. did not get the perfect slice as you. cake crumbled upon cutting. It might be that you cut the cake when it was still very fresh. Chilling it when you have put on the crumb coating will give it some more stability before cutting. Mine did not turn out well. The food colouring didn’t seem to take so I don’t have vivid colour at all and then batter consistency was very odd. Perfect example of a Pinterest fail. Hi Melissa – I am very sorry to hear that. I have made the cake many times and it has never failed me. The colouring you used might be the culprit – I used Americolor soft gel paste food colouring. Liquid food colouring won’t be strong enough and might dilute the batter too much. This is a fantastic cake Lucy and I love the macarons on top. I like the brighter colours and the buttercream really works – naked cakes are one of my favourite things. Not sure what I can say apart from that looks truly spectacular and I wish I had both your photography and baking skills! It is so gorgeous Lucy! Beautiful. The pastel colours are lovely and the decorations are just perfect. Am guessing you all enjoyed it a great deal! I want a bit! So beautiful! I could just stare at it for ages. What a gorgeous cake – and I bet it tasted great, too! just so elegant. I adore the colours you've chosen here, they're perfect for Spring… well, it's sunny today at least! This cake is over the top amazing!! What an inspiration, pinning and shared, I am just stunned with how beautiful it is and it must taste amazing!